I provide petsitting and Dog Walking services. In your home or in mine. I can stay the whole time at your home or come visit several times a day. I also can walk your dog, give it medicine, bathe it, and anything else you would like. While I'm in your home, I can also bring in mail, do light housecleaning, take out/bring in trash cans, and whatever else you'd like me to do. If you have your pet come to my home, it can sleep wherever it wants or my dog crate if you prefer. 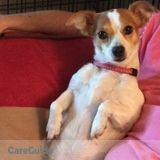 I have a 5 yr old daughter who loves dogs and a very friendly Chuhuaha/Jack Russell mix, she's female and spayed. Plus up to date on vaccinations. If you would like me to just come and walk your dog for you, I can do that also. I could bring my little dog to walk along side of yours if your dog likes the company!